In the nightcap, Pawtucket fell in a closer 5-4 decision. Bogaerts again led the offensive attack, going 3 for 4 with a double, an RBI and a run scored. Overall on the day. the star shortstop was 5 for 7. Middlebrooks matched the effort by Bogaerts, going 2 for 3 with a walk, a double, a RBI and a run scored. Tony Thomas tripled and Ronald Bermudez doubled, both in two-hit efforts. With several of the Pawtucket rotation regulars needed in the majors, Clayton Mortensen made his second consecutive start. The righty gave up four runs on seven hits in four innings. Brock Huntzinger took his first loss of the season in his 43rd appearance between Portland and Pawtucket. Huntzinger allowed a run on three hits and also walked two. It was his first earned run allowed since July 12. Portland fell 4-1 to the Richmond Flying Squirrels (SF). Terry Doyle got the start and kept the Sea Dogs close through the first six, giving up just one run. However, a three-run homer in the seventh proved to be the critical blow. Miguel Celestino allowed just one hit in two innings of shutout relief. The Sea Dogs missed several key scoring opportunities, going 0 for 9 with runners in scoring position. Flying Squirrels pitchers wanted little to do with Garin Cecchini. The third baseman walked three times in four plate appearances. Christian Vazquez extended his hitting streak to seven games, going 2 for 3 with a walk. During the streak, the catcher is 13 for 26. J.C. Linares also had two hits for Portland, including a seventh-inning double. Salem piled on 14 hits in a 13-4 rout of the Winston-Salem Dash (KC). Almost every starter had a noteworthy game, with Blake Swihart (pictured) representing the offensive star. The 2011 supplemental first-rounder drove in four runs as part of a 3-for-6 night. Swihart collected two doubles and scored a pair of runs. 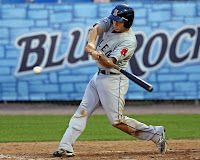 2012 top pick Deven Marrero set a career high, getting on base five times. The shortstop went 2 for 3 with three walks, three RBI and two runs scored. Stefan Welch scored three times in a 2-for-4 effort that included a sixth-inning solo homer. Matthew Gedman reached base four times and scored three, going 3 for 4 with a double and a walk. Gedman has hit in eight straight contests, going 15 for 34 with eight runs scored and five extra-base hits. Mookie Betts and Keury De La Cruz added a double apiece, and De La Cruz leads all Red Sox minor league players with 31 two-base hits. The offensive explosion made things easy on Salem pitching, and Heri Quevedo responded with a strong outing. The right-hander struck out a career-high seven batters, giving up just one run on three hits in six innings. The win brings Quevedo's record to 5-5 on the year. Despite a nine-hit effort, Greenville fell 5-1 to the Asheville Tourists (COL). It was a mixed bag for Cody Kukuk, who took the loss for the Drive. Control has been a concern all season for the left-hander but Kukuk did not walk a batter in his six innings of work. It marked the first time all season he did not issue a free pass, and he did so while also striking out seven batters. Unfortunately, his downfall was the long ball. After allowing only two home runs all season, Kukuk gave up two on Thursday. In all, he gave up five runs on six hits in those six innings, falling to 4-10 on the year. Raynel Velette and Jack McGeary both threw an inning of shutout relief. McGeary, who struck out two of the three batters he faced, is unscored upon in five of six outings since his promotion to the Drive. An eighth-inning single by Kendrick Perkins scored Mario Martinez with the Drive's only run. Perkins collected a pair of hits, as did Tim Roberson and Aneury Tavarez. Lowell missed its chance to complete a three-game sweep of the Mahoning Valley Scrappers, as the contest was cancelled by rain. It will not be made up, as the Spinners do not visit Mahoning Valley again this season. Scheduled to play a doubleheader against the GCL Rays, the GCL Red Sox saw game one suspended in the second inning, tied at zero. Fourth-round pick Myles Smith made his professional debut before the rain set in, giving up one hit and striking out one in a scoreless inning. The suspended game will be completed on August 12, and the nightcap will be made up as part of a doubleheader the following day. The DSL Red Sox were struck by rain as well. Down 2-0 in the third to the DSL Rays, the game was suspended due to the weather. There is no word on whether the game will be completed. Player of the Day: There were several highly qualified candidates, as Thursday saw some stellar offensive performances. Xander Bogaerts, Will Middlebrooks, and Deven Marrero would all have been worthy picks, but the nod goes to Blake Swihart. The 21-year-old went 3 for 6 with four RBI and two doubles. Swihart is off to a tremendous beginning to August, going 11 for 25 in six games to raise his line to .287/.359/.417 on the year. James Dunne is a Staff Writer for SoxProspects.com.